"After our long uncertainty and attempt in seeking extraterrestrial existence, an ethereal being finally responds." 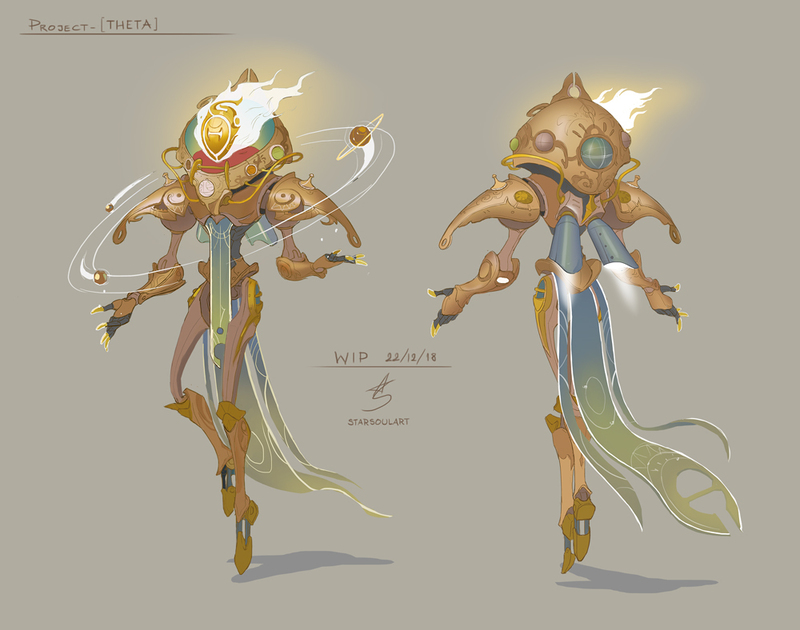 THETA is a living star that powers his body mech using his seemingly infinite energy source. Theta Beam - Shoots powerful ray that burns everything in its path. The challenge has finally come to an end. It has been a great experience meeting new friends and seeing many approaches and ideas from different artists. I have learned a lot about myself: my strengths, my struggle, my current thinking process, pretty much where I am as an artist, and I gained a very strong motivation to push my skills even further. The greatest thing I got from this challenge is this character. I did my very best, and hopefully one day I will be able to use him again! Thank you so much everyone and good luck! Since I'm neither a mech or steampunk expert, I'll also be doodling random stuffs as well in case some ideas pop up. Considered it as a reference board. 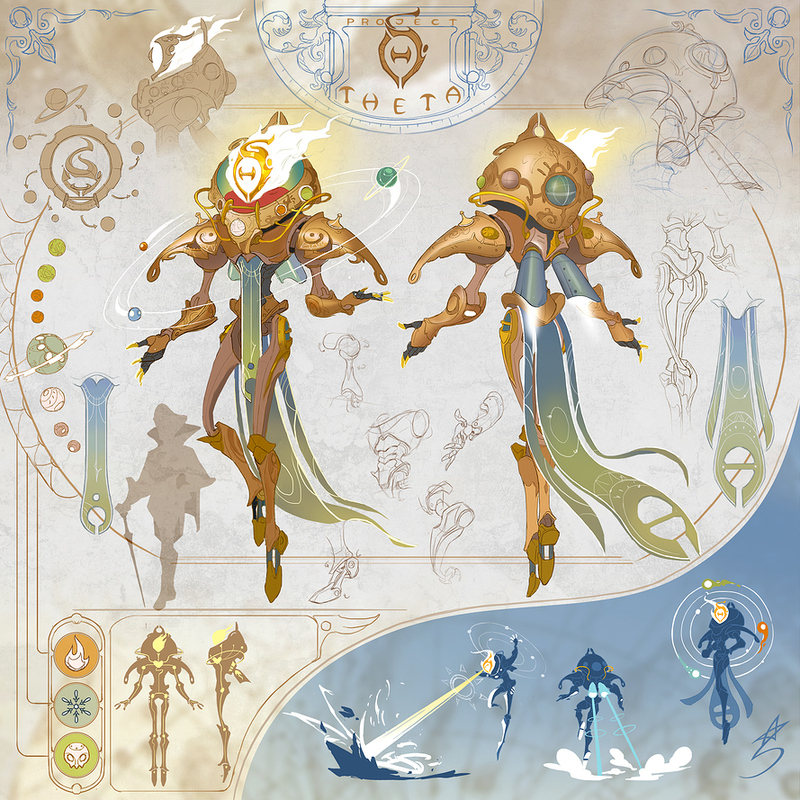 So far I got a rough sketch of the silhouette I want, but I still don't like the armor shape. 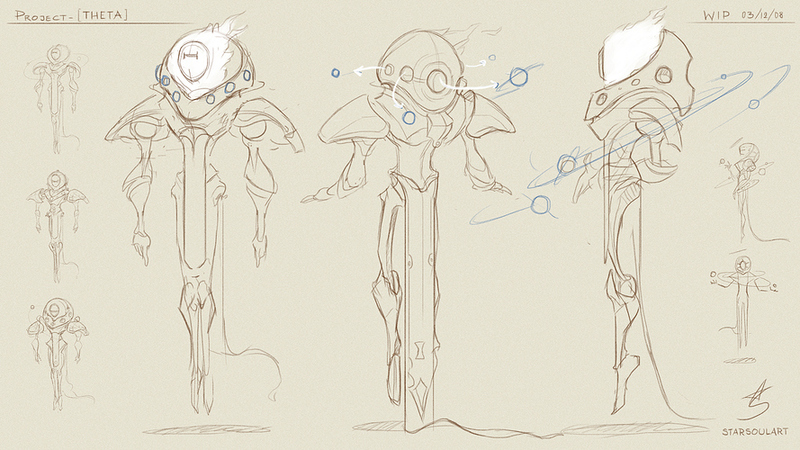 Too sci-fi so I'll be making him look more antique with brass material as I get into some variations of the detail. This looks pretty cool already! Haha hi again!!! Thank you so much! Oh this looks fun! I like the kind of "superman physique" in the second set of sketches, I think you've done a great job there. Thank you! Actually good point with the superman physique since the character's on the Heroes side, I'll make sure to keep it! 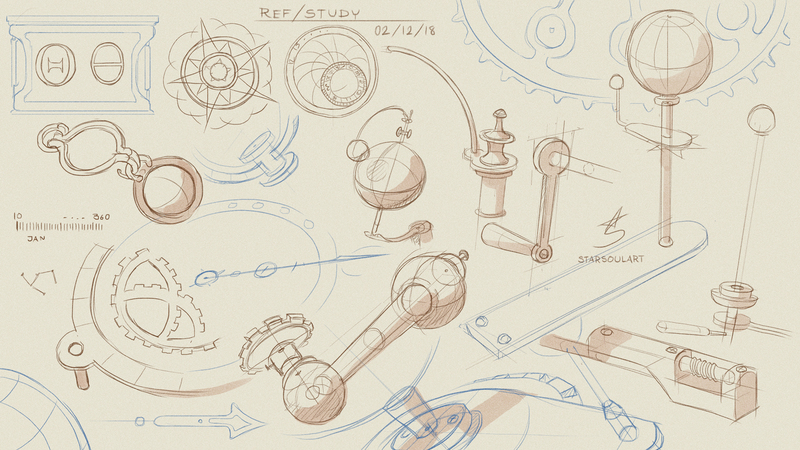 i love that you took the time to do preliminary studies. keep up the great work! Updates. Did one last random culture and pattern studies. As well as sketching parts of the character to get to understand his anatomy and joints clearer. I personally enjoyed building him up part by part from my own understandings rather than making random silhouettes, it just makes a bit more sense for this character, and to me. Don't get me wrong, mass silhouettes are a good way-to-go as industry standards don't take my approach for granted! I'm always more of an animator-kind of artist rather than an illustrator, so as much as I would love to do more pose sketch, well, I already have enough information to piece everything together and start a clean character front back now lol. Til next update! It's going to be gorgeous. it has to, with all those sweet curvy lines! @rgdraw @hirtenmaina @Fris Thank you friends I'll do my best as well as enjoying the most out of this challenge! He's a 'sun energy', technically a living power source in a mech. Later will generate some clothing designs and variations of his face mask. Also needs distributing level of details and resting areas properly. Currently not satisfied with his arms, still adjusting it's length and bulkiness. Enough info to start planning illustration, until next time will see some back view, colors and composition! It look so cool! Nice progress on this! Here is the semi-final version of THETA front and back. 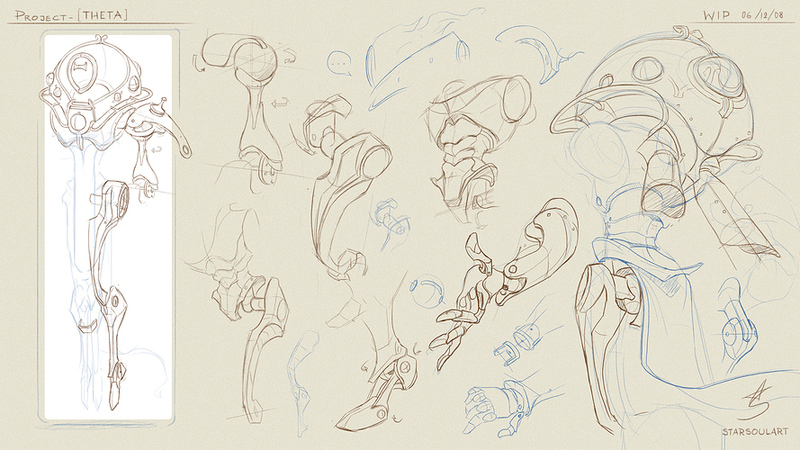 Here's a rough layout of his final character sheet. 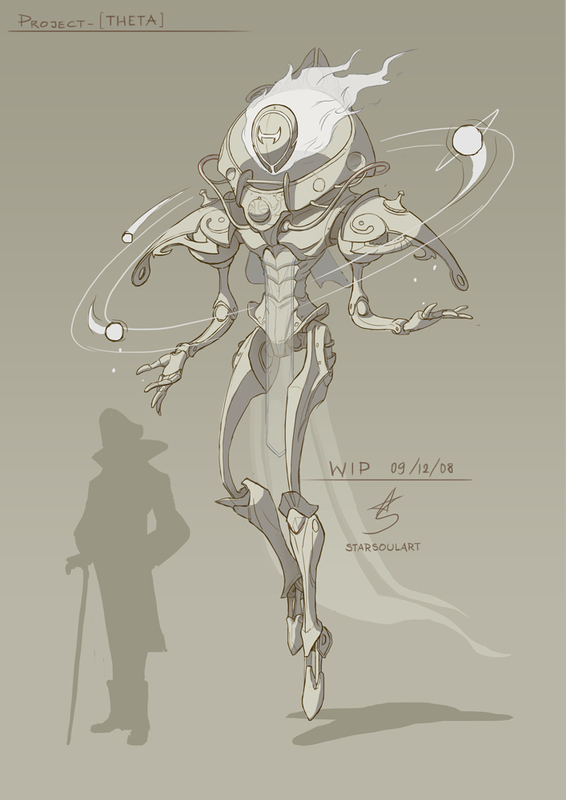 I still have some spare space to add his skills ( some Gravity force control and he can shoot THETA beam, like his name suggest), I'll leave this part aside for now and focus on the illustration. 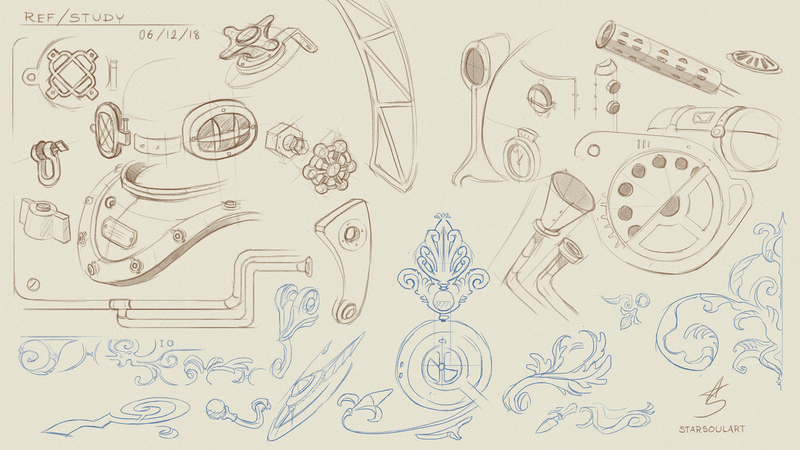 When I doodle some better supplementary stuff I'll just keep replacing elements here until it's complete. 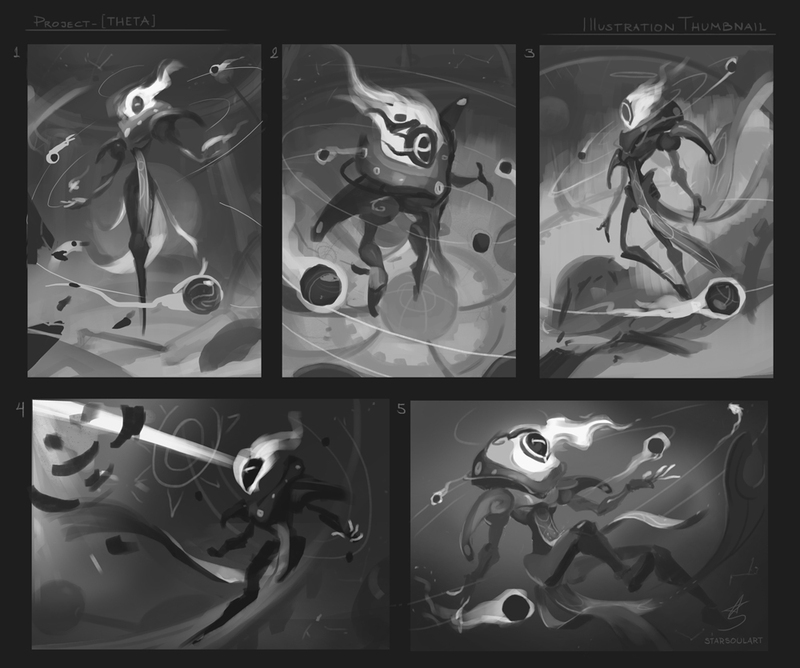 I had a big struggle for days choosing thumbnails cause all them have different strengths and weaknesses. 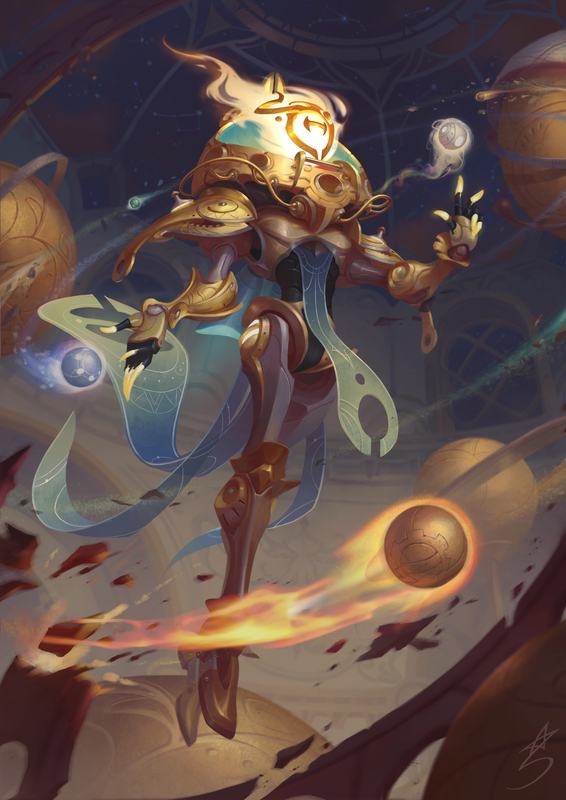 My ideal picture in general is: The character standing in an orrery room doing his gravity skills, IF can show sky with constellation would be extra great. -2- Gets that powerful dynamic angle and beautiful circle composition and overview of the orrery room, but I was doubting the high angle gives that 'intimidating' feel that doesn't fit the character's passive vibe. -3- Got a really peaceful desert surreal feeling that makes the character look big and passive, but is it too passive? As much as it fits, this is war. -5- I really love this one to be honest, really nice pose, but to be fair this one is too erm...delicate lol. And I'm afraid it has no space to give the background some story. So here's what I decided to do: I combined 2 and 5. My best effort to get THETA to float in an orrery room with sky and constellation, and him passively doing his gravity move (have the planet hit some obstacle to suggest he can destroy things), while keeping his heroic character in control. I got the color key, and correct some perspective issues. Hopefully I can push it to the finish stage within the remaining two weeks, I really do cause I'm pretty much in the danger zone now. Oh well, best is not to panic. At this stage I already forgot about this being a contest, I just want to do this character justice. Oh my goodness this is absolutely wonderful and I love it. 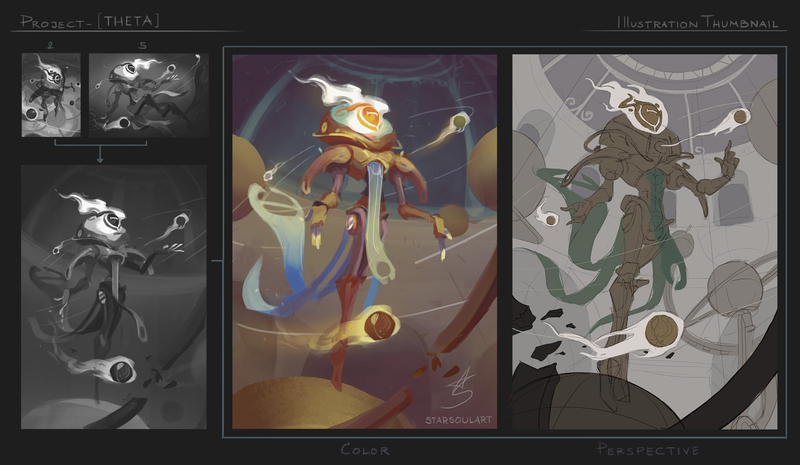 The colours seem really thematic, I really appreciate how much detail you're going into explaining your process and thoughts on how the piece has evolved. The only thing I can think to say is that the hand positioning in the colour preview makes the character almost seem passive, which maybe for an "active superpower" isn't ideal, but then you have the orbs providing the motion plus you're clearly experimenting with hand positions anyway. Not really got much to contribute other than a lot of enthusiasm for where you're going, this is awesome. And damn that looks awesome! I love what you choose for the illustration, great work! Thank you for the heads up a smallest suggestions can be of big help!